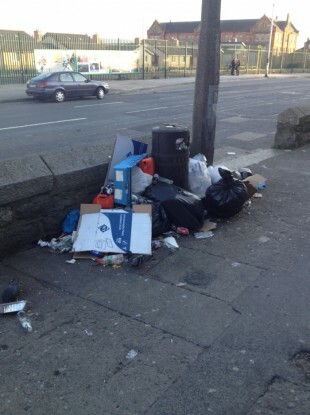 DUBLIN CITY COUNCIL is to begin the process to try and ‘name and shame’ illegal rubbish dumpers. Councillor Cieran Perry told TheJournal.ie that the council has agreed to write to the Minister for the Environment Phil Hogan requesting a change to legislation so that it can ‘name and shame’ illegal dumpers in future. Currently, this is not possible under the Data Protection Act. The council also hopes to introduce new by-laws that would enable it to access the information of people purchasing bin tags. This issue will come before the council for approval in July. The aim would be to identify those putting out untagged bags, and take action against illegal dumpers. The news comes after Dublin City Council (DCC) announced that it plans to end street cleaning temporarily in parts of the north inner city (NIC) to prevent illegal dumping. The move has been heavily criticised by An Taisce. Cllr Perry said he and fellow councillors predicted the privatisation of waste collection would lead to excessive illegal dumping. “Unfortunately we have been proved right,” he said. Some of it was happening anyway [but] because the council had a very efficient waste operation it wasn’t as noticeable. The council has now set up the North Inner City Litter Action Group (NICLAG), which is monitoring dumping, and which recommended the break in rubbish collection at blackspots. Cllr Perry said he has been “pushing and pushing and pushing” for the issue to be dealt with for a number of years. He suggested that “the logical solution would be if the council takes the [waste collection] service back under their control” as it is a public service, similar to the transport system. It’s understood that public services such as transport and waste collection shouldn’t be profit making – we should try minimise losses obviously. The argument is if they had to break even on the service that the charges per household would be huge: my argument is we shouldn’t be breaking even. There are other things we can make the money on. Cllr Perry said “it really is depressing to see the rubbish just dumped there” and that people should be named and shamed to try and discourage others from dumping rubbish illegally. Tax defaulters can be named and shamed due to certain legislation, and the aim is to bring in an amendment so that illegal dumpers can also named publicly. The man heading up the NICLAG is Brendan Hayden, Assistant Area Manager of the Central Area in Dublin City Council. He said that even when DCC was collecting the rubbish there was dumping, particularly in NIC area due to the mix of domestic dwellings and businesses, and a high footfall. The action group is examining the NIC street by street and analysing the level of rubbish there. It meets fortnightly and Hayden reports on their findings on a monthly basis. It is a pilot scheme and a full report will come during the summer. It is due to this group’s work that the council agreed to temporarily halt rubbish collection in a number of blackspots. Hayden said that they have found in the areas where rubbish is in bags, people tend to leave bags out every day, not necessarily on a day where bags are collected. A lot of untagged bags go out and these are are just left on the street for the council to pick up. Private collectors only collect bagged waste that is paid for and tagged, and do not issue fines. DCC does have the facility to issue fines, but Hayden said it is not always possible for the council to identify the culprits, as usually there is no identifying information in the waste. It is this behaviour, people dumping untagged bags indiscriminately on the street, that leads to the issues that the council is trying to tackle. We are out of the business of collecting rubbish – this defeats the purpose that we are back in again collecting rubbish. A previous temporary ban on collecting rubbish on the southside found that there was anything between a 40 – 60 per cent reduction in illegal dumping. “It is not something that we are going to continue to do – at same time it is not feasible and sustainable for DCC to have waste management trucks out there every day collecting rubbish. It is not fair on people paying,” said Hayden, adding it is a small minority of people who are putting out the illegal waste. During the Easter period in the NIC area alone, over a four – five day period 1,000 bags were collected by the council because there were no waste collection services. New by-laws are coming in to try and ensure that landlords provide ample spots in their dwellings for tenants’ rubbish. Hayden noted that in the NIC, there are multi-tenanted, multi-unit houses, which means that it can be difficult to determine who the bag owners are. “There seems to be no end to it,” said Hayden of DCC staff collecting illegal waste. “It seems to be increasing all the time.” The council has received many emails from people about the issue. Hayden acknowledged that there can be financial issues behind people not buying tags, saying that the finishing up of the waste collection waiver (which was honoured in 2012 by Greyhound), “is going to create another difficulty” that needs to be addressed. Over the last eight weeks 103 fines were issued over and above the number usually issued for illegal rubbish in the NIC. Hayden noted that 15 environmental groups have formed in the last two to three months in Dublin city, and the council is keen on supporting them in enhancing their local areas. There has been no increase in staff numbers needed to collect rubbish, said Hayden, but he thinks an examination of the ‘bin and bag situation’ could be beneficial. The impact of the rubbish on tourists in Dublin is one major concern, and the action group was formed following a scathing IBAL report that criticised the litter blackspots in the NIC area. Email “Council could 'name and shame' illegal rubbish dumpers”. Feedback on “Council could 'name and shame' illegal rubbish dumpers”.